The 100 Strangers Project is a challenge to photographers to "[step] out of your comfort zone to a new level of portrait photography: take 100 portraits of people you don't know." It's an experiential project to expand "social and technical skills needed for taking portraits of strangers and telling their stories." 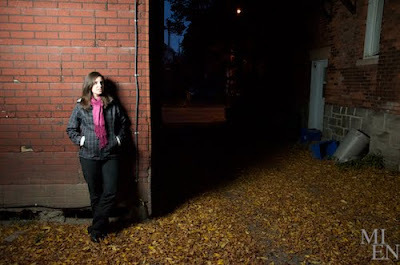 Kim of LeMien.ca decided to make her project about style and set her lens on the people of Ottawa. Her photos capture candid moments with local Tweeps, Bloggers — you know, fun and interesting folk. She is nearing the end of her project and I was recently fortunate enough to be #89 in her journey. It took me months to get my nerve up to email Kim. In fact, it took a lot of convincing for several reasons. Kim's blog is sooooo awesome. I am a total fangirl. So colour me intimidated. Many kewl people had been featured. And the idea of "style" was kinda scary. Some of my tweeps have been featured including Nat, Franco, Katharine, Vivian, Don and Jen, Elizabeth, Andrea, Stephanie, Lara, Dave, Dani, Justin, Jess, Chelsea. Wow. I didn't realize just how many there were until I started that list. Kim, it turns out, is absolutely lovely. Completely unassuming, with an openness that's just so warm and welcoming. And there's nothing cuter than watching her and her Mr. Darcy work together on the shoot. Pure charm. The results were just as fun as the experience, in my mind. But you can decide for yourself, just go check out the site and feast on the phodo-pr0n.